"There’s trouble in River City! When smooth-talking con man Harold Hill arrives in a small, tight-knit town in Iowa, he expects to dupe its residents with his elaborate moneymaking scheme: Despite his complete lack of musical literacy, he will convince everyone that he is a brilliant bandleader and recruit all the boys in town to form a band, pocketing the cash for instruments and uniforms. The problem? Some of the town members, especially the stern librarian, Marian Paroo, don’t quite buy Harold’s story. As Harold struggles to keep his scheme afloat, he also finds himself increasingly attached to the townspeople, who have all experienced a positive change since Harold came to town. Complicating matters even more, Harold is also falling head-over-heels for the beautiful Marian. 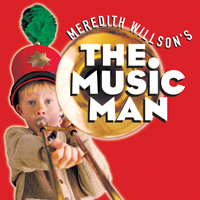 Meredith Willson's The Music Man is All-American as apple pie and as charming as can be. Tickets are $11 for adults and $9 for students.